I just finished book #2 for Book Riot’s Read Harder Challenge. The prompt was an alternate history novel and I was originally planning on reading Dodger by Terry Pratchett, but honestly the history just wasn’t alternate enough for me. So, I switched to Wolf by Wolf by Ryan Graundin. This one I read as an ebook through Overdrive. It’s a great place to go for ebooks and eaudiobooks! Imagine The Hunger Games meets Code Name Verity. That is exactly what was going through my mind as I inhaled this book. 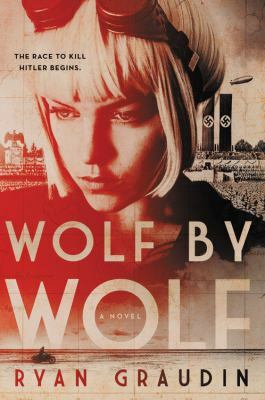 Wolf by Wolf is set in 1956; however, in this version of history the Axis powers won the war. To celebrate their supreme power, Hitler and Emperor Hirohito host an annual motorcycle race that lasts days and crosses continents. Yael, a young Jewish girl and member of the Resistance, has escaped a concentration camp where she was subjected to painful experiments to modify her appearance. From these tests, she developed the ability to skinshift and uses this skill to impersonate one of the competitors in this year’s race. Now, Yael has one goal: to win the race and get to the victor’s ball where she can assassinate Hitler. I was really drawn in by the book’s unique plot. Yes, there have been other books that reimagine history and depict a world in which Hitler prevails. But, to use the piece of history where Nazi “scientists” performed horrible genetic experiments on people and flip it so that those experiments are used for good in the Resistance….genius! The other part of this book that I thought was so great was the development of Yael’s character. Long story short, she is a bada**. She can morph her physical features and take on others’ identities, she can ride a motorcycle across crazy terrains, she can fend off scheming and vicious opponents, and she is the assassin selected to take on the ultimate bad guy – Hitler. Yet through all this, Yael is still keenly sensitive to the world and the people around her. She sees that not all is easily categorized into black and white and she struggles with this throughout the book.